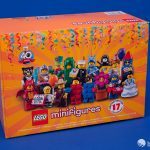 Series 18 celebrates the 40th anniversary of the minifigure. 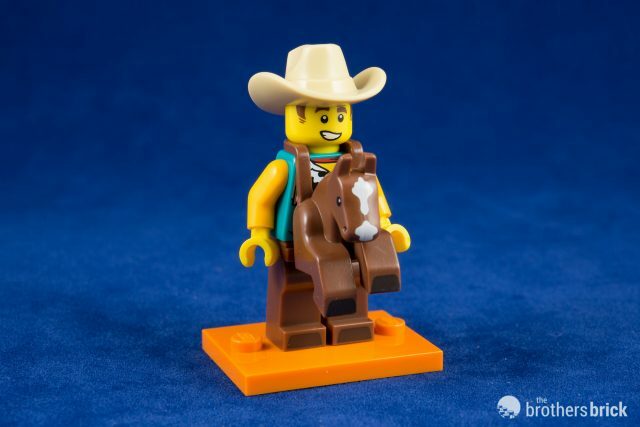 First introduced in 1975, the original minifigure had no printing, and while minifigures in general are not seen as threatening, this first minifigure was particularly ‘armless, featuring no distinct limbs. 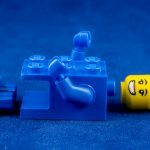 The minifigure was redesigned in 1978 to include poseable legs, arms, and hands, as well as that iconic smile. 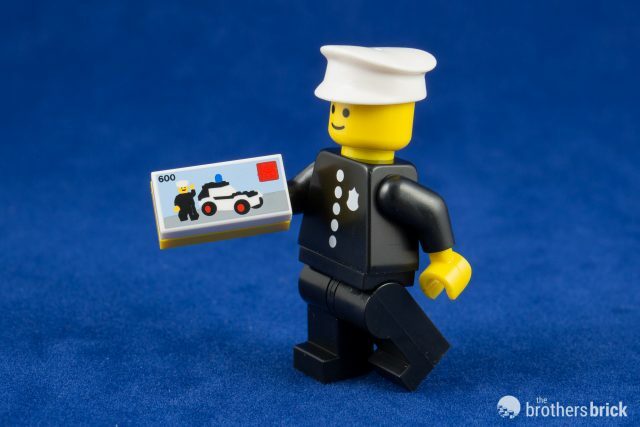 The first minifigure with the new design was a policeman featured in set 600 Police Patrol. 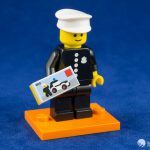 2018 marks the 40 years of the minifigure as we know it, and that classic policeman adorns the logo for Series 18. 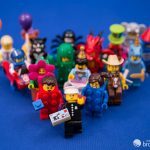 Over the past 40 years, minifigures have come in all manner of styles and themes, and have become increasingly detailed. 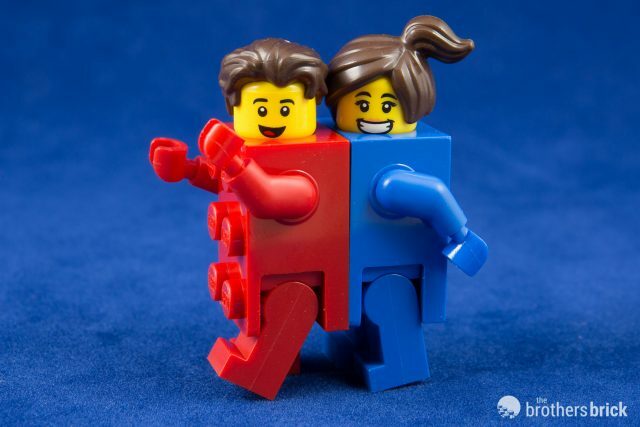 In a move some fans still consider controversial, in 2003 LEGO began moving the characters in its licensed themes to more realistic skin colors. 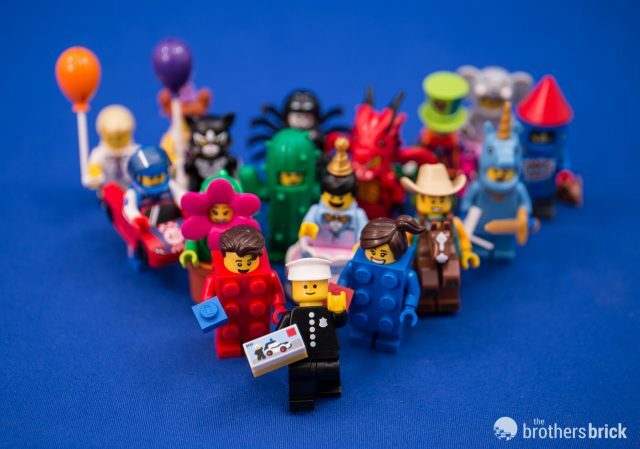 Bright yellow, however, is still the unifying color for the minifigures in all other themes, including CMFs. 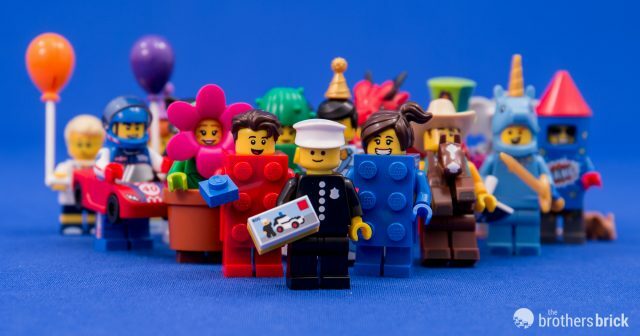 Since the introduction of the CMF line in 2010, LEGO has realized the potential for minifigures to be sales drivers, not simply add-ons to the traditional brick product, and has actively worked to increase the variety of unique minifigures. 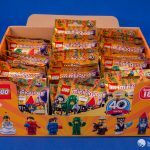 LEGO hasn’t actually released a regular numbered series since Series 17 a full year ago, instead sidestepping the numbered system with The LEGO Batman Movie Series 2 and The LEGO Ninjago Movie Series. 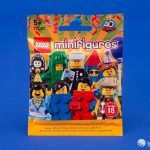 Series 18 minifigures, like most series before them, come in cases of 60, with each character retailed individually in a blind pack. The color scheme this time is orange, the third time orange has been used for a series, following Series 4 and Series 15. The foil packs are tightly packed in three rows within the case, and there won’t be much here to surprise veterans of collecting this theme. 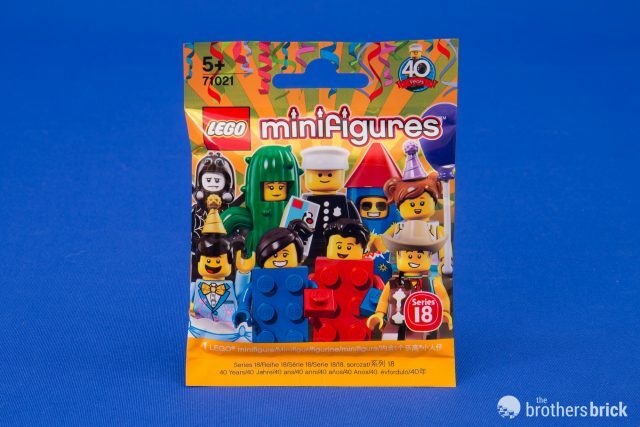 This series celebrates the 40th anniversary with a party theme, dressing both the packaging and characters in festive attire. 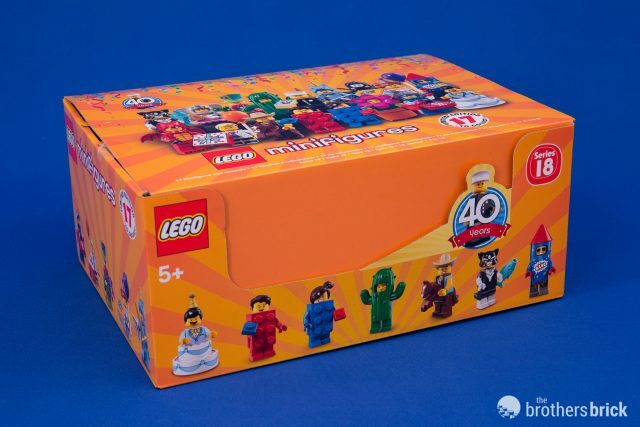 The bags feature a confetti motif along with the 40th Anniversary logo, and each character is dressed in costume. Inside each bag is the standard folded guide with pictures and checkboxes for each character. Series 18 isn’t the first series to feature costumed characters. 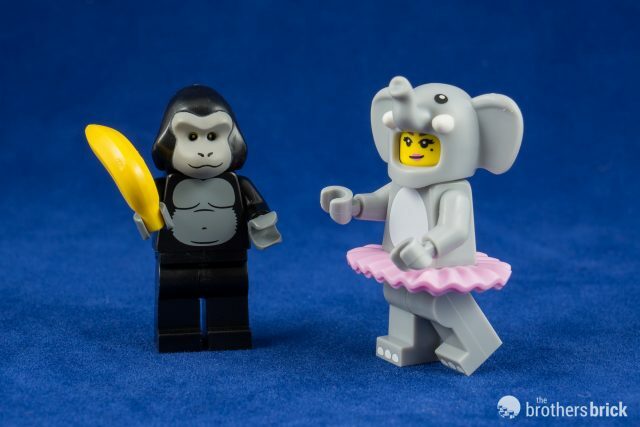 That began with Series 3’s Gorilla Suit Guy, who is arguably the first “minifigure in a costume.” Throughout the CMF’s history, the costumed characters have been among the most popular, especially with kids, and this series finally indulges costume fans by putting nearly all of its characters in some sort of suit. 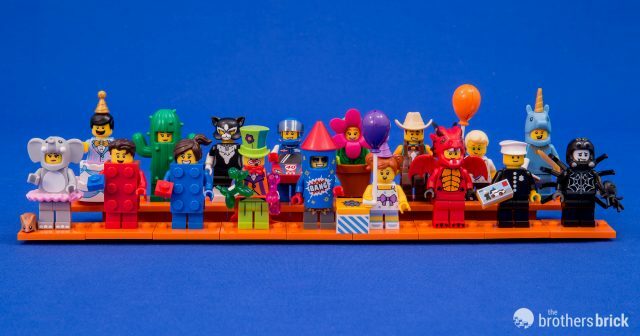 In keeping with the festive style, this is also the first regular series to use non-black minifigure stands, featuring orange unprinted stands with all of the characters. 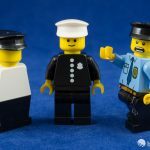 With only a single Classic Police Officer per case, each case can only complete a single set of all 17 figures. Excluding that character, a case will have 3 full sets of 16 of the characters, as with most previous series. 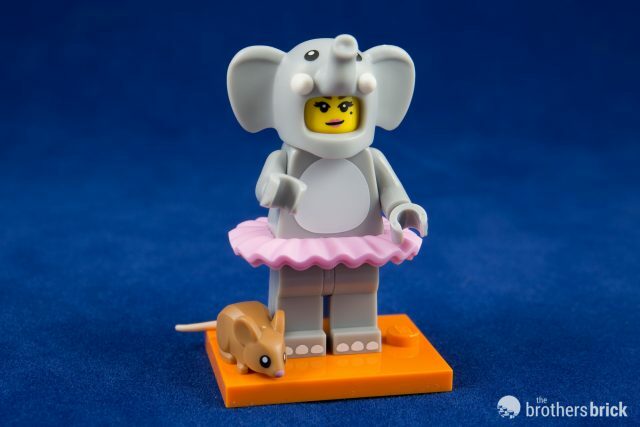 The Elephant Suit Girl has a simple grey costume whose only printing is the head details, a white belly patch and three white toes on each leg. She has a small mole beneath her eye and smirks as she looks out through the elephant’s mouth. The head is a new mold and feels a bit more cartoonish than some of the other animal costumes. 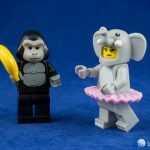 Of course, what sort of elephants go to parties? Dancing elephants in pink tutus, naturally, so perhaps the elephant need not be overly realistic. The tutu was introduced in Series 15’s Ballerina, but also appeared in pink with Fairy Batman. The most interesting new part here is the adorable mouse. 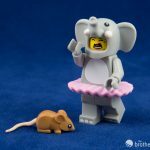 Other than a highly stylized Friends mouse, LEGO has never produced a mouse before. We’ve gotten two styles of rats, but never a friendly mouse. This tiny mouse sits across two studs with the tail curling around a third. The mouse is medium dark flesh with a light flesh colored tail of soft, flexible plastic. He’s got a tiny printed pink nose and big eyes. 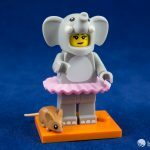 Elephants are, as the Mythbusters proved, terrified of mice, so the Elephant Suit Girl’s face is double sided with a wonderfully expressive shriek on the back. 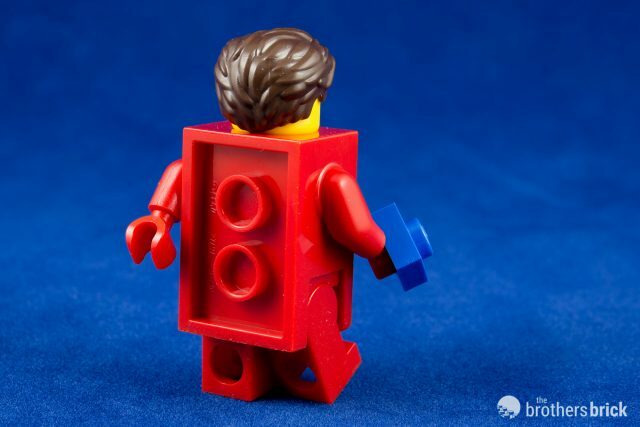 What if we had a LEGO minifigure dressed as a LEGO brick? 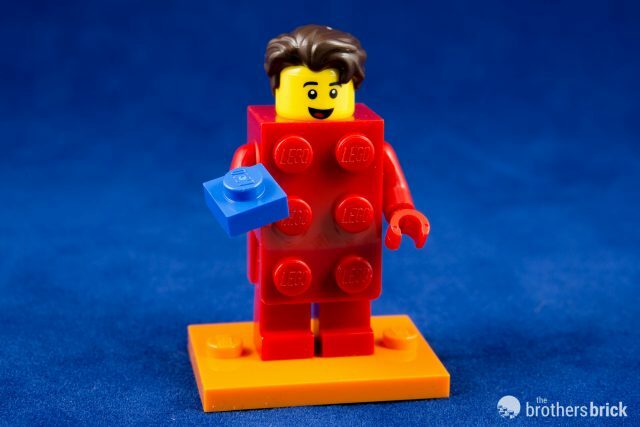 What if he carried an even smaller LEGO brick? Does he know his world is made of bricks? Is that too meta? Well, it’s awesome no matter the philosophical implications, and as one of the most common characters in the series, there will be plenty to populate your city. 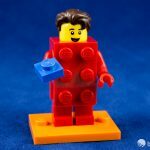 Brick Suit Guy has a happy-go-lucky smile on his single-sided head, with tussled dark brown hair up top, and the head sits in a recess in the brick torso. The brick is 4 plates thick, so it’s not quite a dead ringer for the real thing, but it definitely gets the point across. The back of the brick is just like the underside of a plate. 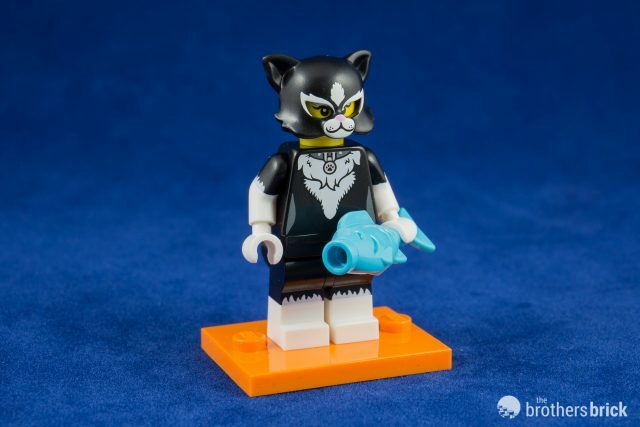 My only complaint about this character is that I wish it were the more iconic 2×4 brick, but the dimensions would totally enshroud a minifigure and not allow for leg movement, which the 2×3 brick does, at least a little. 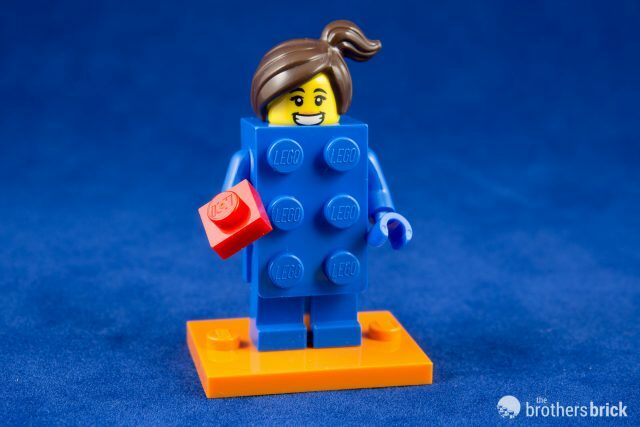 Wearing a matching suit to Brick Suit Guy and carrying a red 1×1 plate, Brick Suit Girl is similarly common. She’s got an exuberant grin and Wyldstyle’s hair in solid dark brown. 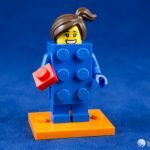 Other than the face, neither brick costume character has any printing. 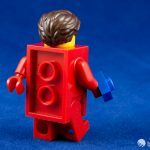 The brick costume is a modified torso to which legs and a head attach, not a piece that slips over the torso like most costumes. And yes, you can stick them together. You know you were going to, so I’ve saved you the trouble. The party clown is one of the few characters in this series that I wouldn’t consider to be strictly in costume, as I presume that he’s a professional clown, not simply dressed as one for a party. 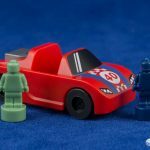 This is the third clown in the CMF lineup, and each has been distinctly different, but with a fascinating intentionality. Modern clown organizations recognize three unique styles of clowns: Whiteface, Auguste, and Character. Way back in Series 1 we got an Auguste-style Circus Clown, then Series 10 brought us a Whiteface-style Sad Clown. This clown represents the Character-style Tramp Clown. 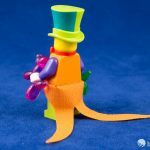 He’s sporting a wildly vibrant outfit of neon colors, with a lime green top hat, red bowtie, orange torso with purple stripes and arms, and lime green legs. 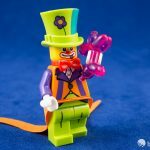 The Clown has long orange coattails, the same design as many of the ones worn by recent Joker minifigures. 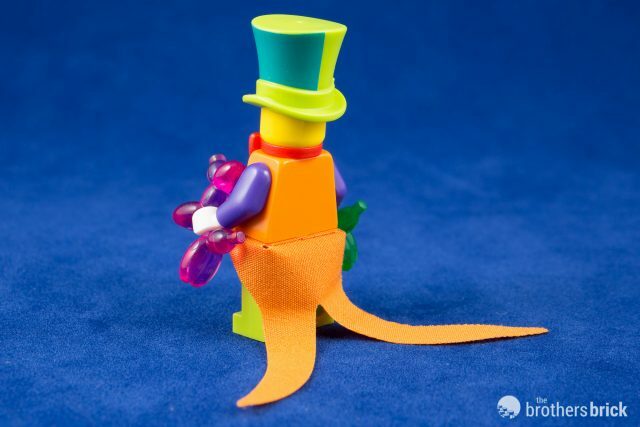 The top hat is half painted in teal. 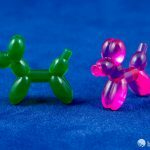 The Party Clown is a balloon-tying master, and carries a brand new element for the balloon animals in trans-green and trans-pink. 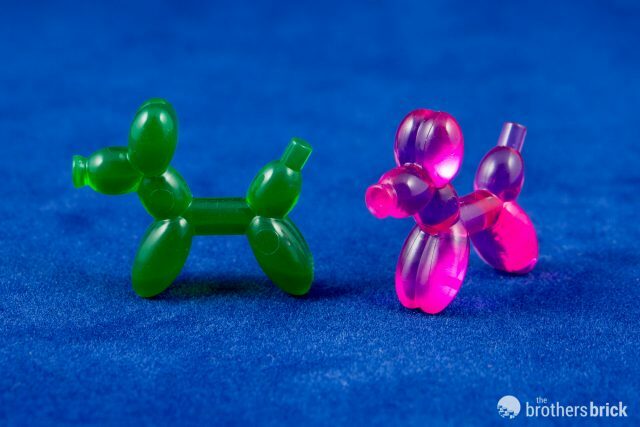 I think they look like dogs, but that’s open to interpretation. 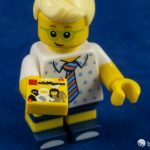 The midsection is a standard rod for a minifigure to hold them, but the that’s the only standard connection point. The tail is larger than a hair-accessory pin (AKA plume hole), but it looks to be a very intentional dimension. If you have an idea for what it might fit, let us know in the comments. 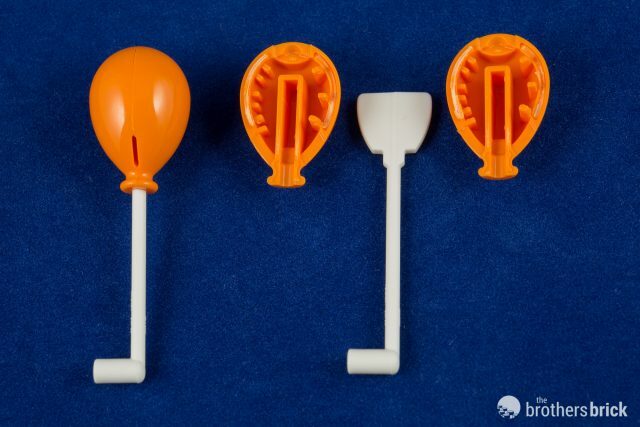 It’s unfortunate that the nose and tail are not standard connections though, and this is a great looking element that would likely find unique uses elsewhere if it could be attached easily. 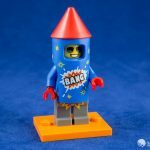 Series 17 brought us the Rocket Boy, but this series is going for something a bit more explosive. 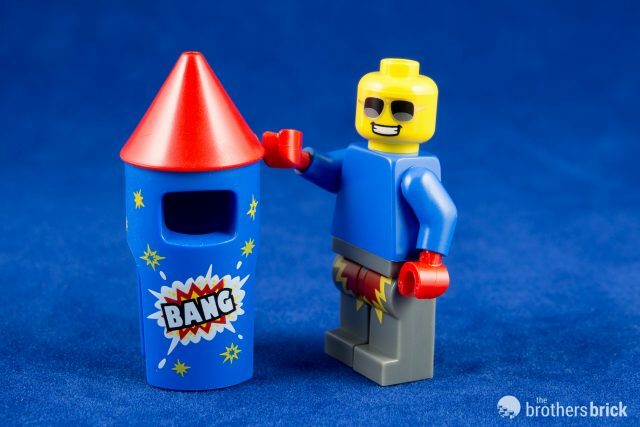 Firework Guy has a giant blue cylinder for an outfit, colorfully adorned with yellow starbursts and a giant BANG firework explosion graphic on the front. He rocks a cool pair of aviators, presumably so he can put them on while dramatically walking away from explosions. 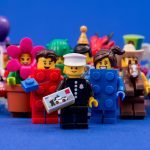 Firework Guy is the simplist minifigure in Series 18, with no accessories at all. 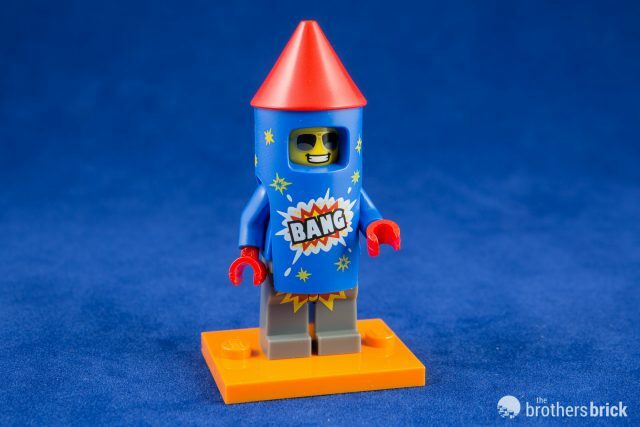 The big rocket costume is made with a red cone and blue bottom, with the two pieces permanently fused. 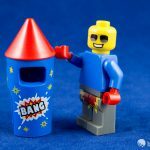 The tip of the cone has a small hole for accessories, in case you feel like adorning the firework with a party hat or hairbow. 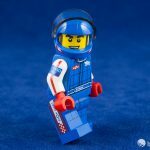 Beneath the suit, Firework Guy’s shirt is just plain blue, though the legs are printed with an explosion pattern. I do wish the firework had some sort of fuse—it feels like the one thing that’s missing. 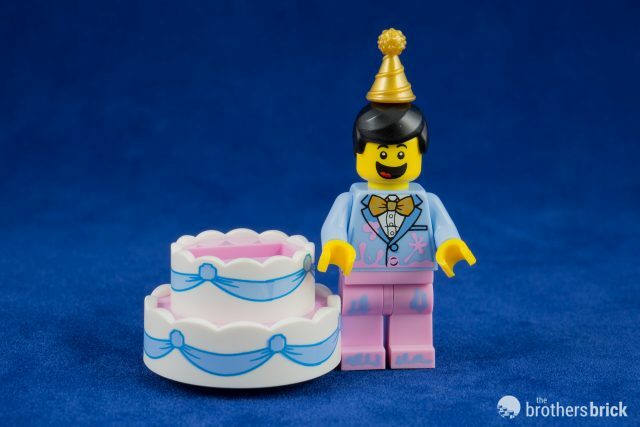 Everyone loves a good birthday party, so it’s about time the denizens of your LEGO town can celebrate them properly. 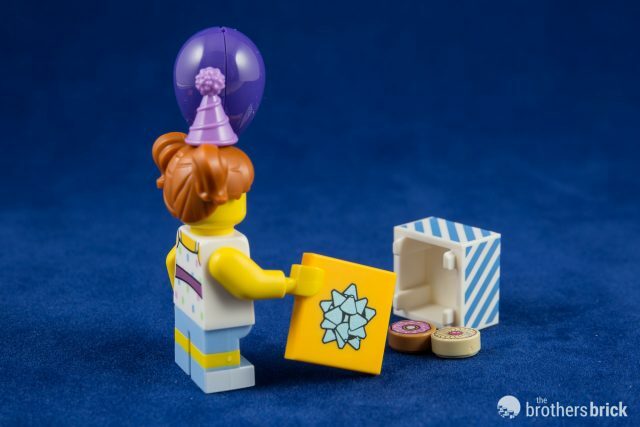 The Birthday Party Girl is ready for an awesome party with a balloon, party hat, and present. She’s one of the two young children in this series, and features a youthful face with a delighted smile. 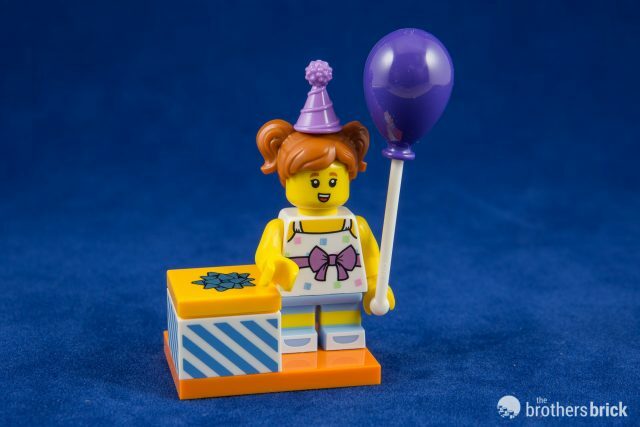 Her light blue legs are double molded with a yellow stripe, and the hair has two pigtails and a hair-accessory hole for the party hat. 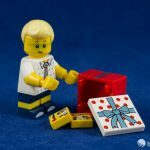 Of course, the present isn’t just a lovely striped 2×2 brick. 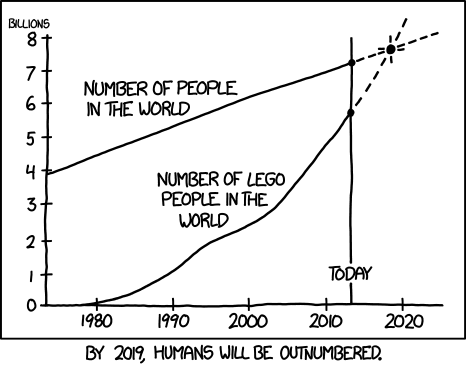 It’s actually a new element; a small container exactly one brick tall. 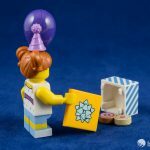 It’s just big enough to fit a few 1×1 tile treats inside, and the Birthday Party Girl comes with a donut and a jelly-center cookie, neither of which is new. The box is striped on all 4 sides, and is covered with a 2×2 bright orange tile printed with a bow. 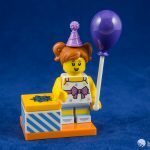 The Birthday Party Girl also carries a new balloon element, which we’ll cover in more detail with the Birthday Party Boy. 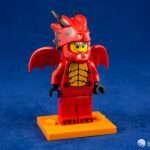 Dragon Suit Guy is one of the few mythical creature costumes from any of the series, along with a pair of unicorns and cute devil. He’s got an open face with freckles and large eyebrows. 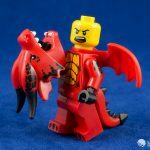 Dragons are known for their tempers, however, so the opposite side of the head features an angry visage with squinting eyebrows. 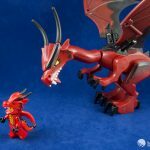 The most prominent part of the suit is the the large dragon head, which has two removable horns. 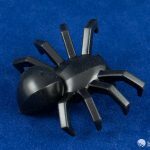 The suit is rounded out with a pair of hard-plastic wings and a soft rubber tail. Only the head is a new element, but it all comes together perfectly as though they were made for this character. The printing on the torso, arms, and feet also work great to flesh out the costume. 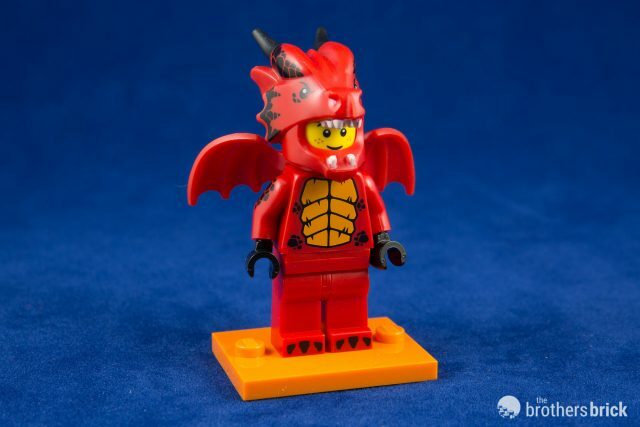 The dragon costume is based on the red dragon that’s appeared in a number of castle sets over the past 10 years. 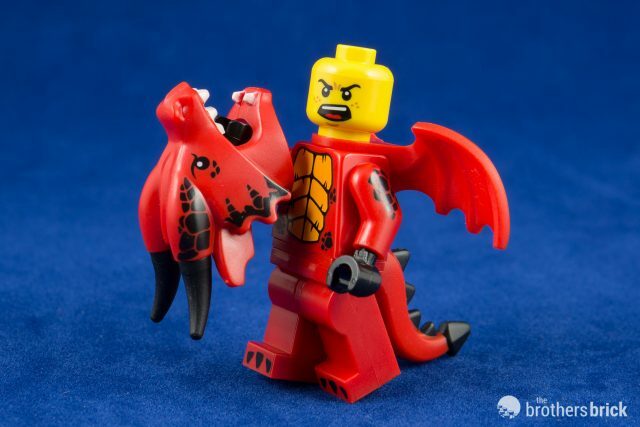 Of course, a guy in a dragon suit is only ferocious at a party. Real dragons are much more dangerous. 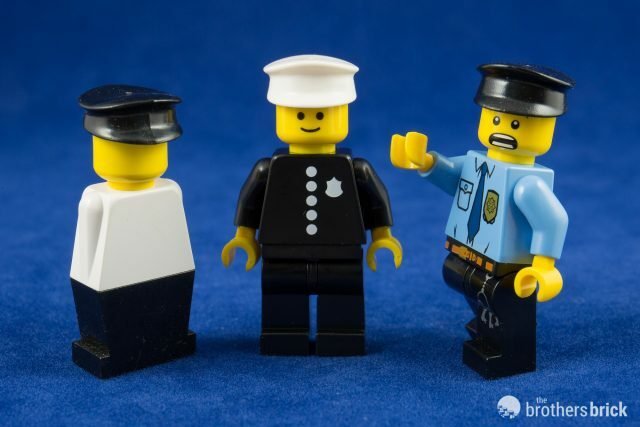 As I mentioned earlier, the policeman was the first proper LEGO minifigure as we know them. 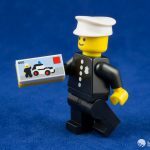 So it’s fitting that for the fortieth anniversary, LEGO goes back to its roots and pays homage to that venerable old figure, and even includes a lovely 1×2 tile printed with the box art from set 600 Police Patrol. 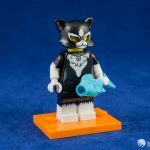 It isn’t a perfect match to the original character, having a printed torso instead of a sticker, though surely few will complain about this upgrade. 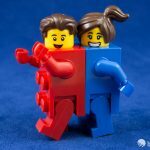 Other differences are necessitated by LEGO’s molds, which have been upgraded throughout the past forty years. This means slight changes to the torso, head, and cap. 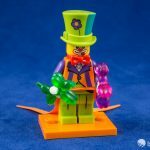 With only a single bag of this character in each case of 60, this figure will be considerably more rare than the rest, though thankfully nowhere near as rare as Mr. Gold, of which only 5000 were released worldwide (and now commands ludicrous prices on the secondary market). 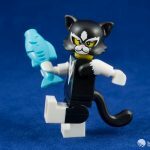 If LEGO must make some figures significantly more rare (and that’s a point I think is far from settled), then I applaud their choice here. Mr. Gold was undeniably cool, regardless of your age, but if adults were unlikely to ever find one even by buying full cases, then young children had no hope at all. 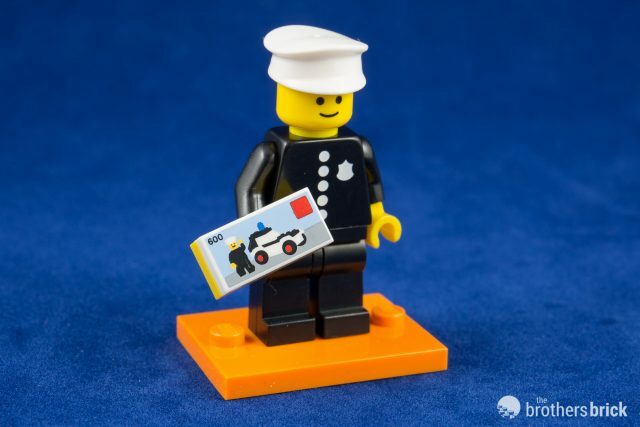 The Classic Police Officer, on the other hand, is a retro version of a common figure that will have much less appeal to most kids compared to the rest of this series. And adults full of nostalgia can afford to hunt for the 1-in-60 chance of finding this guy, even if that means buying a full case to ensure it. There’s always one that one kid who likes to pretend it’s Halloween all year round. 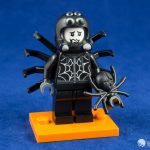 This year he’s dressed as the biggest black spider you ever saw. 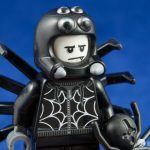 He’s brought along his pet spider, though from the discomfited look on his face, he’s not sure this was a great idea after all. 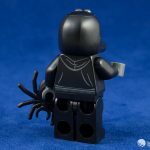 The reverse of Spider Suit Boy’s head has a morose look befitting his black wardrobe, which besides the giant spider consists of a web-printed black hoodie. 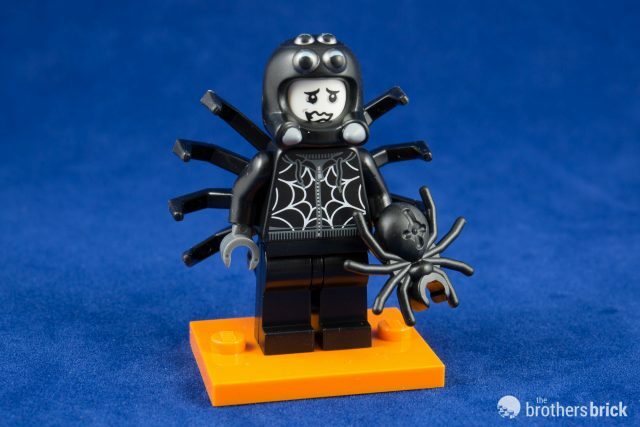 The spider head has four eyes and large fangs. 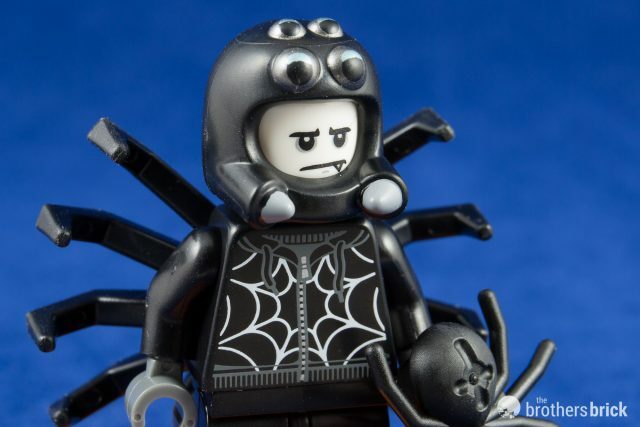 The large spider fits on like a backpack and completely envelopes him from head to toe, with the legs curling around. 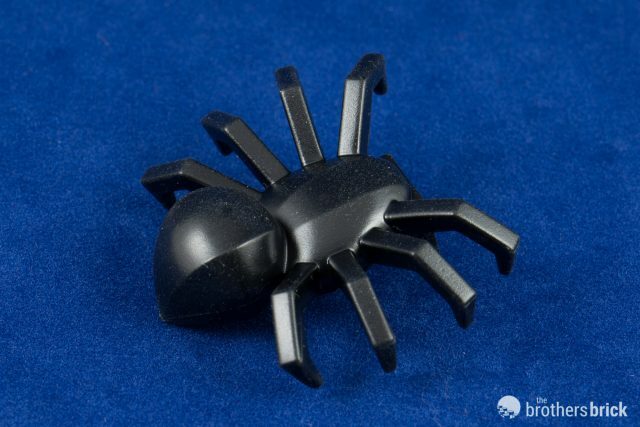 Needless to say, this spider is considerably more likelike than LEGO’s previous eight-legged critters, and is bound to create a bit of fright when it is inevitably used for practical jokes. Thankfully, it’s made of soft rubber, so a hard whack with a shoe or rolled-up newspaper isn’t likely to damage it. The downside is that the soft black rubber makes this piece attract quite a lot of dust. It’s a bit unclear if this guy is merely dressed as a cake, or is springing jack-in-the-box style from a real cake, but given the frosting splotches on his suit, I’m betting on the latter. 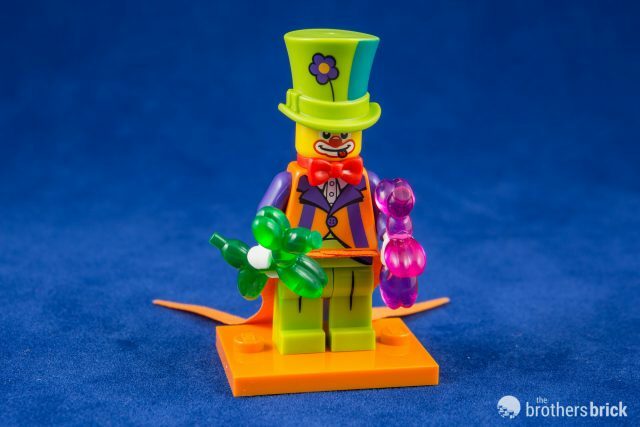 He’s got a Benny-like grin and a classic LEGO male hairpiece, but with one twist: this one has a hair-accessory hole on top, allowing him to wear a party hat. 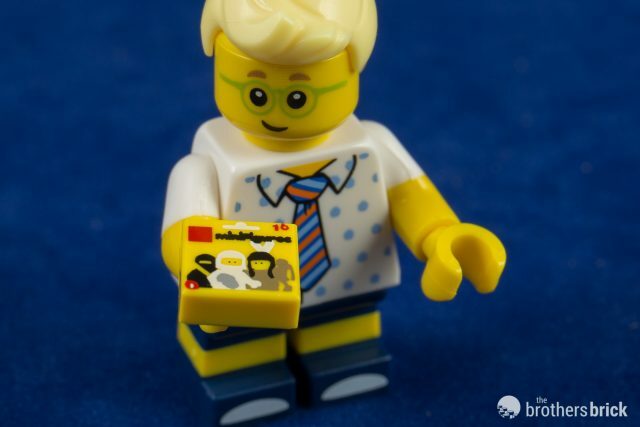 His gold bowtie has tiny minifigure heads on it. The cake is a single hard plastic element molded in pink and white, with printed fancy blue ribbons encircling both layers. 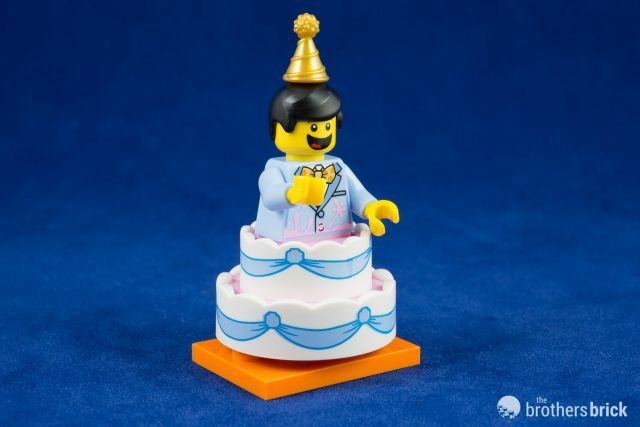 The large slot in the middle would allow 1×2 bricks to stack there (removable thanks to holes in the bottom) turning the cake into a regular cake, so expect to see this part stand in for a lot of traditional, non-surpise-man-inside cakes. The cake is just a tiny bit narrower than 4 studs wide, with a mostly hollow interior. 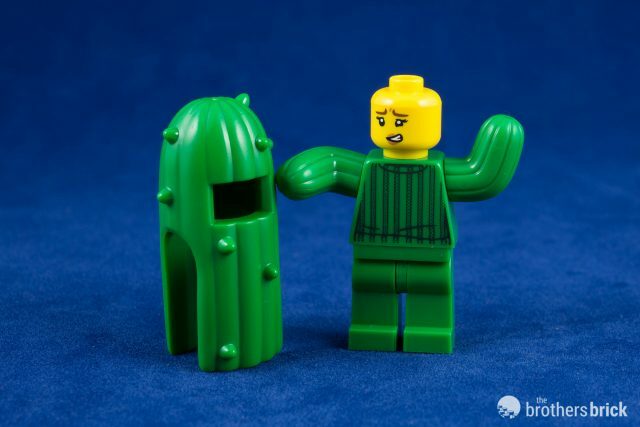 While a tree seems like the more obvious choice for a towering-plant-based costume, LEGO actually introduced a tree costume in the City theme earlier this year. 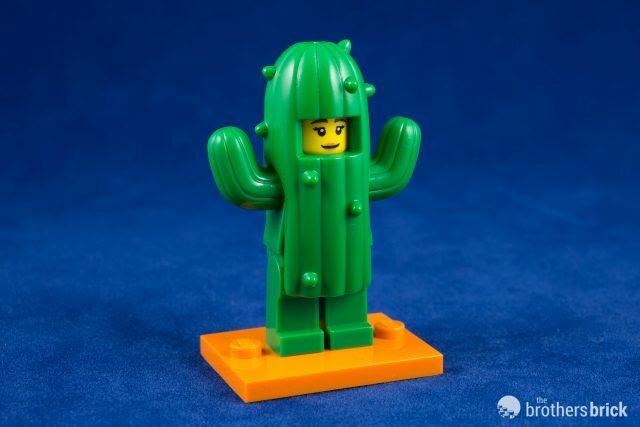 So it is that Series 18 has a cactus, and with a wan smile she’s ready for her place in the background scenery of a high-school production of Annie Get Your Gun. 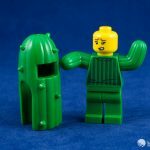 The stately saguaro cactus is iconic in the Sonoran desert of the Southwestern USA, though the real one is a bit more prickly, as noted by the alternate expression. 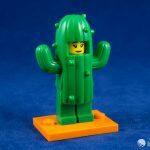 Cactus Girl’s arms are fully replaced by cactus arms, and beneath the cactus costume she’s got a green sweater printed on both front and back. 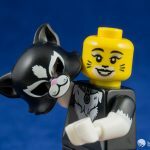 And speaking of musicals, how about a Cat Costume? Cat Costume Girl has white fur printing on her torso, arms, and legs. 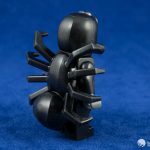 Both the arms and legs are dual-molded in black and white. 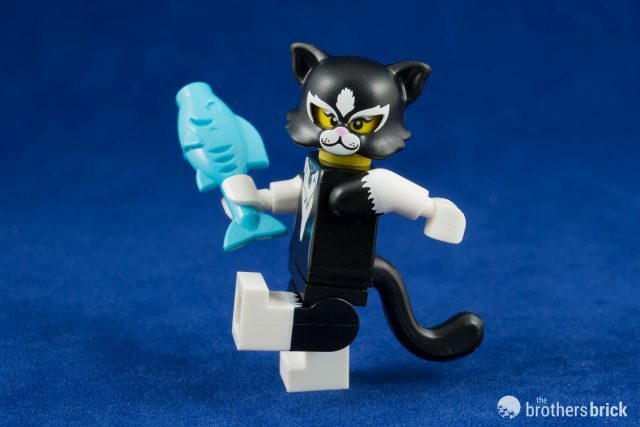 Carrying a medium azure fish (a new color for this element), Cat Costume Girl also has a black soft rubber tail and a new cat mask element with long fringes of fur around the cheeks. 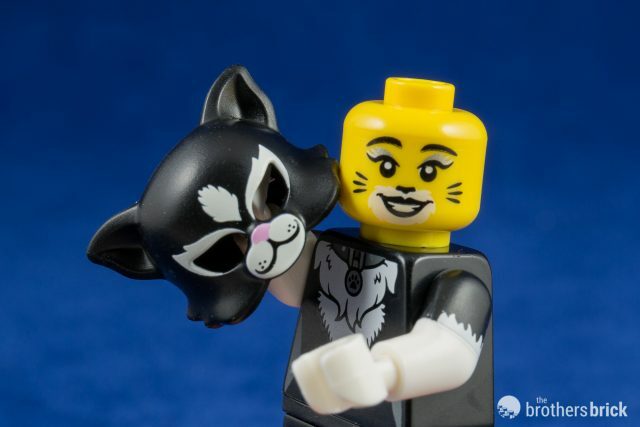 Beneath the mask, she’s got cat-style makeup on, with little whiskers and a black nose. 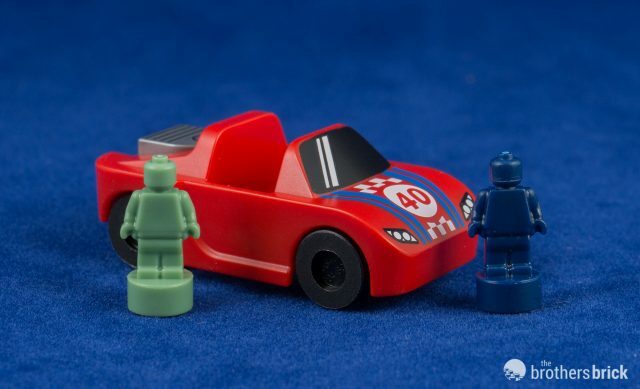 The various minifigure series have brought us robots and lizards and cyborgs and aliens, but this is the first time we’ve gotten a vehicle. 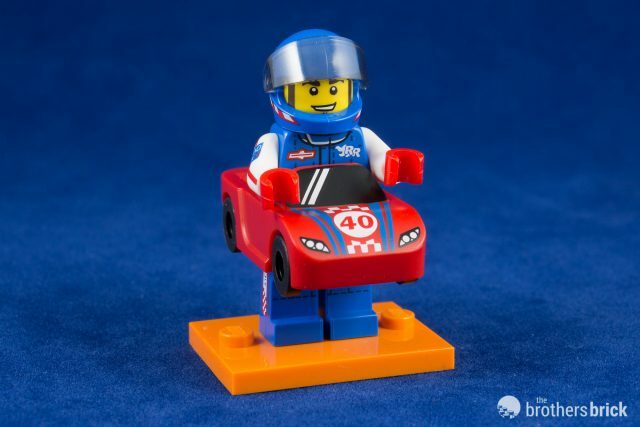 Racecar Guy will boldly drive where no minifigure has driven before, and that’s right to the middle of the party. 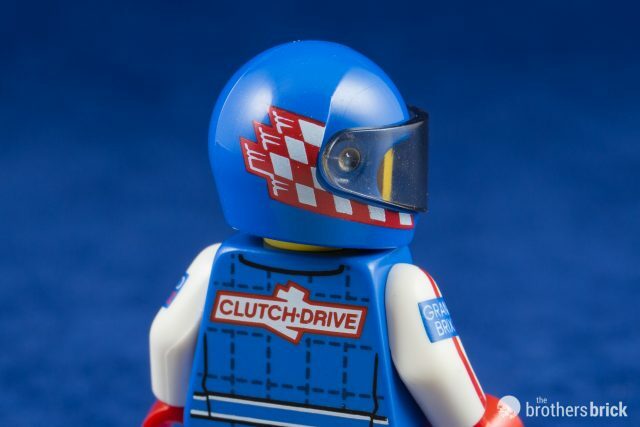 The tiny RR emblem on the jacket is for Rocket Racer, the final boss of the LEGO Racers video games released in starting in 1999. Could it be that this is the long-lost villain, returning to claim his title after nearly 20 years dormant? 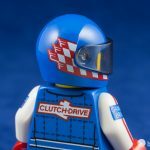 The helmet has a bit of fancy checkered printing, and the racing jacket would look right at home in a Speed Champions set. The car sits across the hips and is made of four elements. 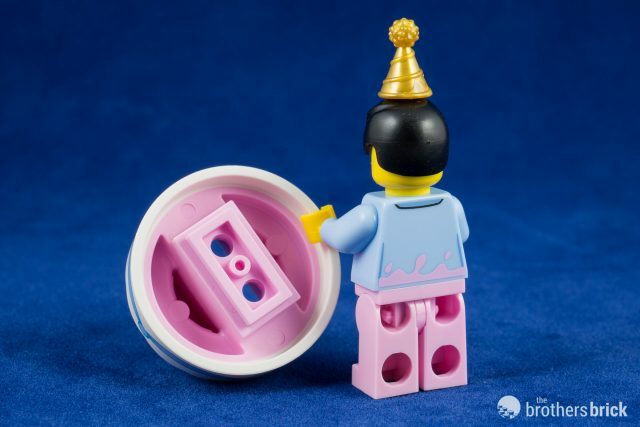 The wheels are LEGO skateboard wheels, and on the rear deck of the car there’s a single stud with a surrounding cutout to socket a curved 1×1 tile with a piston pattern. The body is solid red, with printing for the hood decorations, headlights, and windshield. 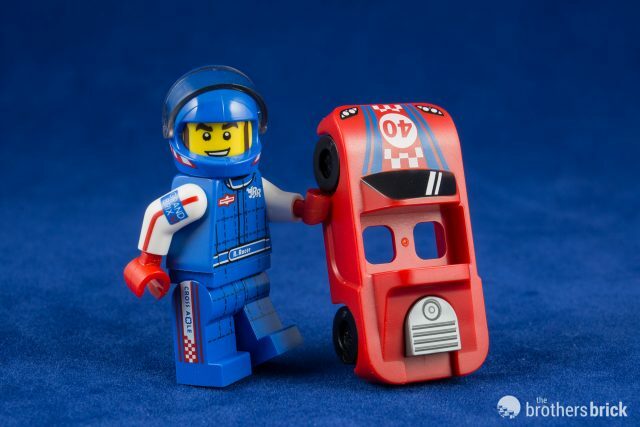 With rolling wheels, this is the smallest official LEGO car, and it’s perfectly sized for microfigures, (though sadly they can’t fit in the cockpit). 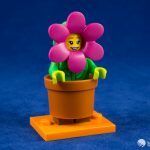 Here to brighten up any mood, the Flower Pot Girl is a vibrant display of magenta petals surrounding a cheerily smiling face. She wears a large dark orange pot, which connects over the hips. 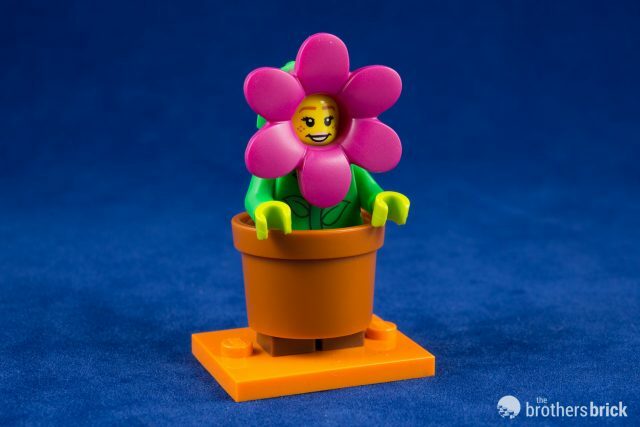 The flower is a helmet dual molded in bright green and magenta, and will surely find good use as an actual flower in fan creations. 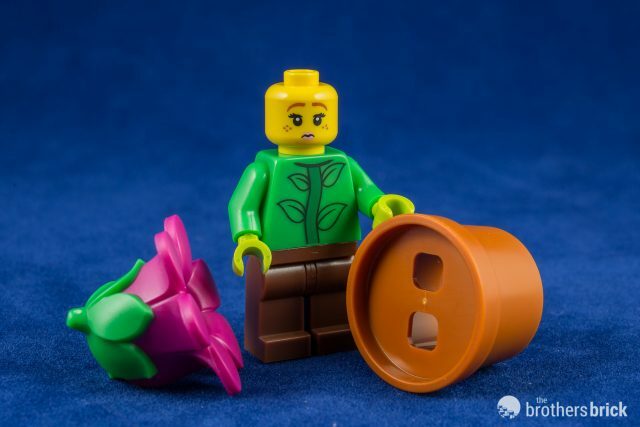 Flower Pot Girl’s bright green torso is printed on the front with the flower’s stalk, and she has unprinted brown legs. The pot itself is completely hollow beneath, but has a solid pane of plastic near the brim, except for the two holes for hip studs. Flower Pot Girl has an alternate expression showing a concerned face. 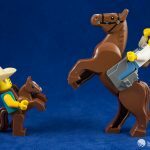 What’s a cowboy without his horse? Just a feller with crooked legs and a funny hat. 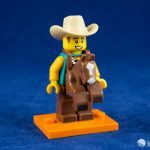 So naturally, if you’re going to do a cowboy costume right, you’ve got to include the horse, and this guy is nothing if not thorough. 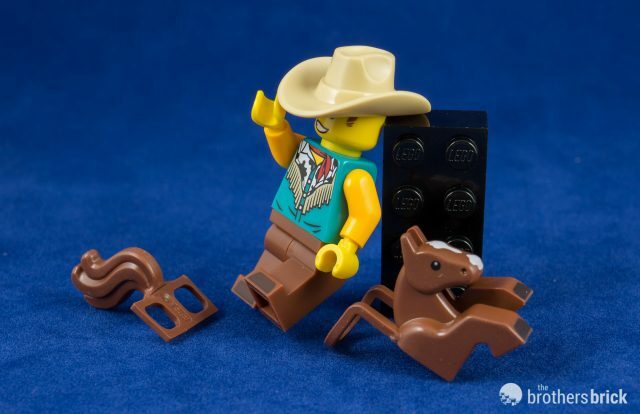 In addition to the horse, he’s sporting a big cowboy hat that’s only appeared in one previous set from The LEGO Movie. 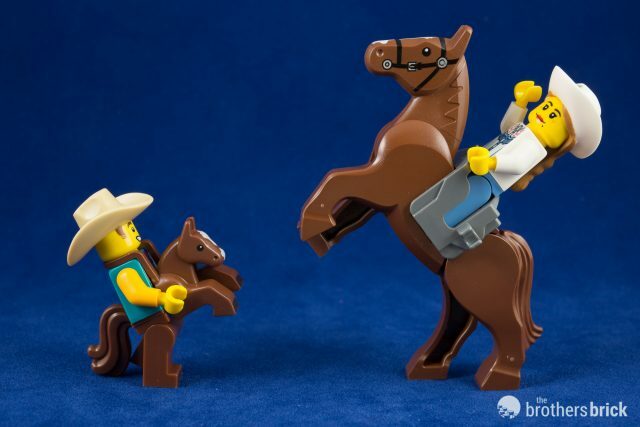 The horse is soft rubber and hangs around the neck, and the tail is similarly soft. 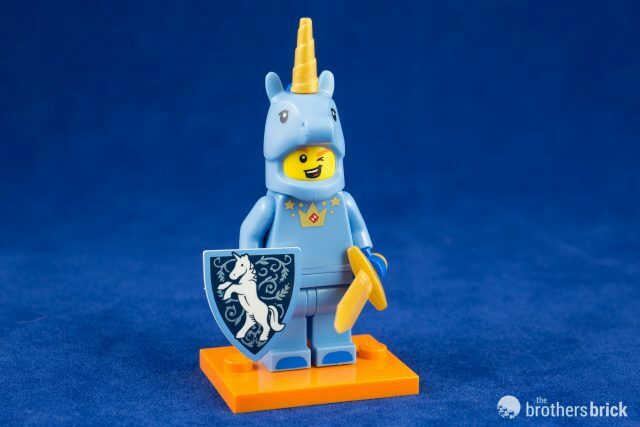 It’s the same element that appears in several other characters, including Unicorn Suit Guy from this series. 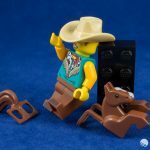 The cowboy’s torso is teal, the first time a torso has ever been produced in that color, and has a fancy fringed leather jacket printed on the front and back. The arms are bright orange, and the brown legs have little black horse hooves printed on the feet. The miniature horse costume is remarkably accurate to its full-size inspiration, right down to the white markings on the face. Time for rodeo, anyone? 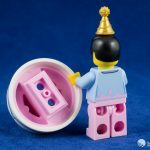 The other half of the pair of birthday children in Series 18, the Birthday Party Boy is looking to party like a professional in his button-down shirt and tie. He carries and orange ballon and a red-and-white present. 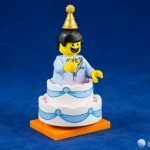 The Birthday Party Boy’s shirt is short sleeved, and he’s wearing shorts thanks to dual-molded dark blue and yellow short legs. 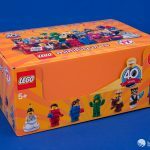 Just like the Birthday Party Girl’s present, this one is also a box with a removable printed lid. 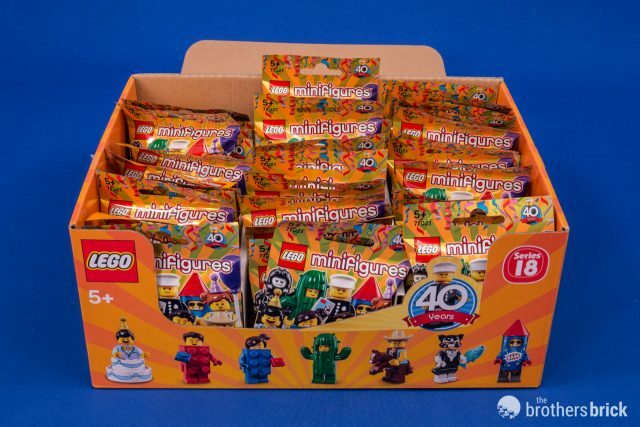 And wow has he lucked out: his present contains two packs of collectible minifigures, and they’re Series 1! 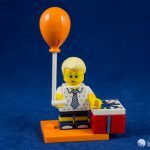 The balloon is a new element, replacing the several different types of brick-built balloons that came before it. 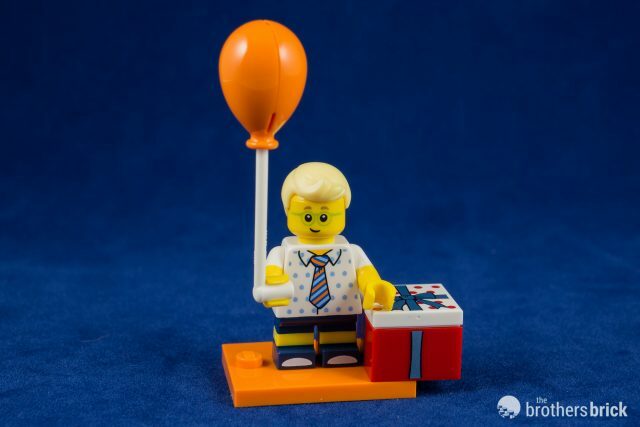 Don’t be fooled by the picture below, however—despite the prominent gaps around the balloon’s seam, the balloon and string come as a single element. We pried one open to see what was inside, but the two halves are sonically welded together, so doing this permanently damages the pieces. They will fit back together but it’s a loose connection, so we don’t recommend following our example. 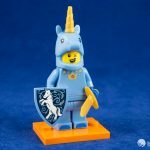 This is the second unicorn suit for the CMF line, following the white-suited Unicorn Girl from Series 13. They’re very similar figures, though the new figure gets upgraded with a few accessories and a new color scheme. 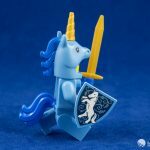 When the party’s over, Unicorn Guy is ready to fight the good fight, wielding a golden sword and a pretty epic unicorn shield. Both the mane and and tail are blue, and the shield is white beneath the printing. 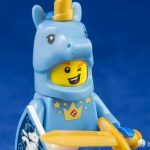 A unicorn onesie is just the thing to bring out the inner My Little Pony fan in all of us, and even better if it’s light blue. 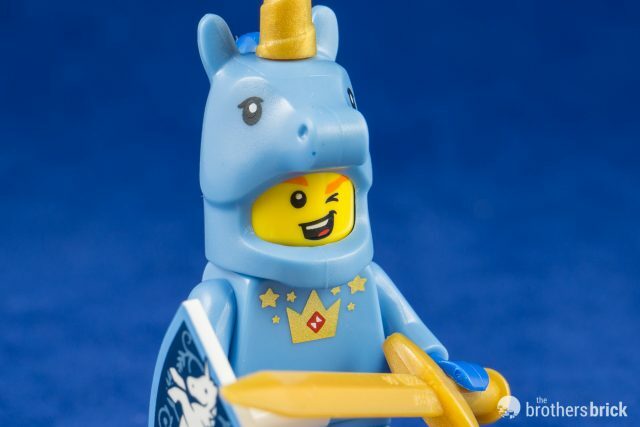 Unicorn Guy knows it’s all in good fun though, as he winks from beneath his massive orange eyebrows. We weren’t able to determine what the logo on the chest is referencing (because we doubt it’s HSBC), but perhaps a clever reader can tip us off. Let us know in the comments which character is your favorite, or if you’ve spotted something we missed! 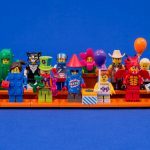 LEGO Collectible Minifigures Series 18 are available from the LEGO Shop Online for $3.99 USD each. I think the decision to have a figure that is only one per case is extremely rude to fans. 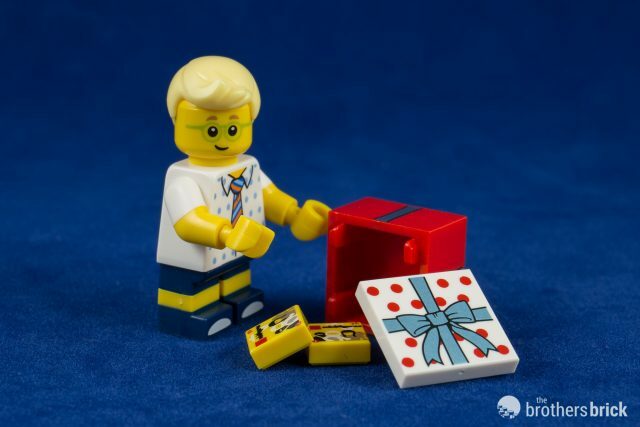 I’m not really sure what the motivation is for Lego to stick to collectors. @Jax, that’s as good a guess as I’ve heard yet. 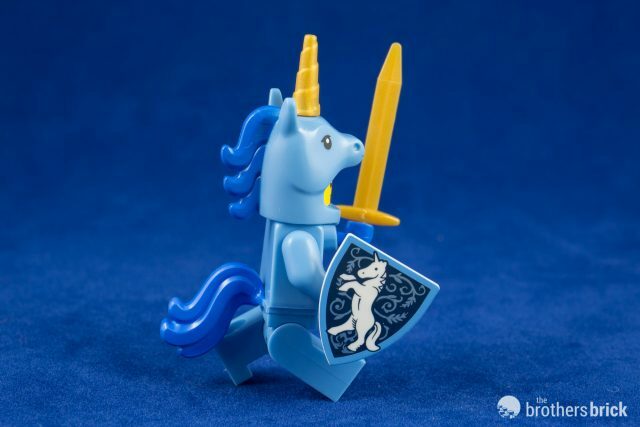 The blue unicorn shield seems to be a lovely visual reference to The Last Unicorn (Animated film), but I’ve got no clue what the chest markings could be in reference to. 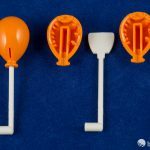 I can’t believe those balloons come pre-assembled and aren’t intended to come apart! That’s madness. Other than that, this whole series looks awesome to me. 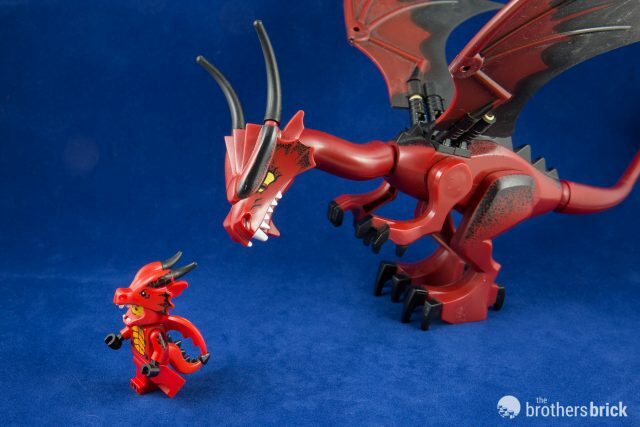 The dragon’s tail is a new piece as well. It looks similar to the Series 5 Lizard man, but that one connect at the neck, not hips. @winston Sometimes you accidentally get a clip where it’s like it is above. Trust me, it’s twice as awkward. 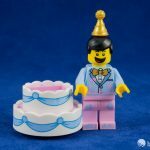 For me, Birthday Cake Guy is the most amazing. 1st of april is the day I will try to find him!! 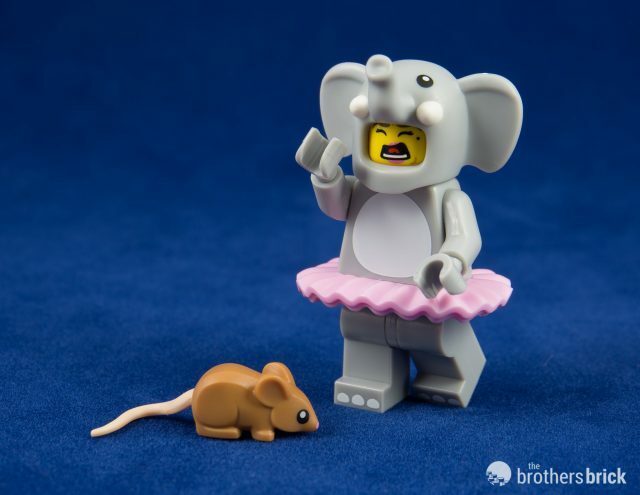 Also, the mouse that go with Elephant Suit Girl is just amazing! 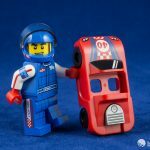 In anticipation for the first physical release of Rocket Racer in LEGO Minifigures Series 18, I built his car from the games but with the colors and details reflective of the car costume piece. 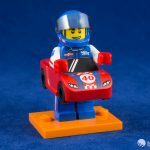 I also created alternate hood designs that showcased Rocket Racer’s iconic RR logo like his car in the LEGO Racers games. 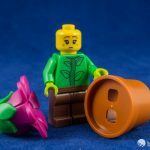 Have you heard of or had an occurance where a part to one of the minifigures was missing when you opened the bag? My boys (and myself) were pretty excited today when we came across a case in the store than had not been gone through. 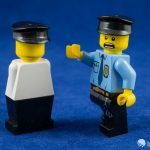 We found the police officer and a few others that we were missing. They (and myself) were just as quickly disappointed when they opened the officer to find there was no white tile piece with the “box” art on it in this package. It’s not like we lost the piece, I was right there when we opened it, and we triple checked to make sure it wasn’t stuck in the packaging. Bummed about that.